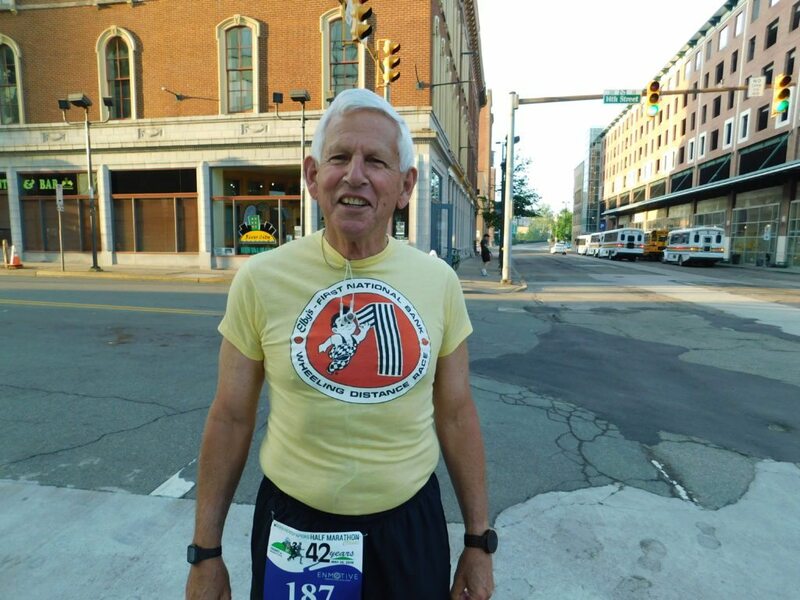 WHEELING — John Palmer is a running aficionado of 40 years who got his start in Wheeling and returned for the latest half marathon, where he finished third in his age group of 70 to 74 years old, at a time of 2:33:17. Palmer, of Charleston, remembers his first race, when he ran in the second Ogden Newspaper Half Marathon Classic in 1978. He has since gone on to compete in other races, as well as taking on a leading role in organizing and promoting racing events in his own hometown. Palmer has made several return trips to Wheeling in the years since, he first ran here. However, he said, the early hours of the race have proven an obstacle. But Palmer has fond memories of the Wheeling event where he got his start. “There were over 1,200 finishers in 1978,” said Palmer who also said the weather was far more welcoming this Saturday than 40 years ago, but some of the elements of the race have changed since then. “It’s an interesting race. You’ve got some fun hills here…I hope it’s a dry race.